I would like to install Java on one of our servers, but I am reticent due to Oracle's bundling of an Ask.com toolbar and some virus scanner. I've read that the java updater even installs these for important security fixes if they are missing, and the toolbar install has a 10 minute delay built-in so you can't immediately remove it if you realized you installed it by accident. There is no need or desire to have even the java browser plugin installed, I just want a nice clean JRE install. I've noticed some applications such as Atlassian Stash install their own JRE, is there some automated installer that I can't find? Can I just copy the JRE directory to my server from one of these? The off-line installers at http://oracle.com/technetwork/java/javase/downloads/index.html do not include bundled software. There is an option to disable future adware installation in the Java Control Panel. The Java Control Panel (jre\bin\javacpl.exe) can be found in the start/app menu under the name Configure Java or in the Windows Control Panel, under the Programs group. In the Java Control Panel, the option is hidden under the Advanced tab, at the very bottom. 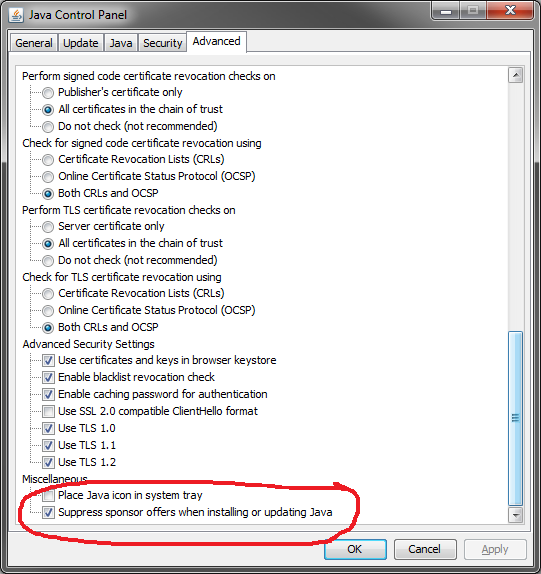 It is named Suppress sponsor offers when installing or updating Java. If you are willing to use third-party software, try Ninite (ninite.com). I've been using it for the past few years for a lot of updating. It's a free unattended installer/updater for things like Java, Flash, Silverlight, web browsers, utilities, developer tools etc., The install/update doesn't need any interaction, just start it and it will install everything by itself, excluding any toolbars or other things bundled with the applications you are installing. On their website, just select which stuff you want from a list, and then a small ~300kb exe file will either update the selected software to the latest version, or install it if it's not installed already. I actually put it on a Task Scheduler job on some computers to make sure their software is kept updated (esp. the Flash runtime). They don't have every piece of software available, but it covers most of what I need, including the Java JRE and JDK. The paid-for Pro version also gives you centrally managed updating, which could be useful for a server. Disclosure: I'm only a satisfier free-tier customer, never had the paid service from or worked for them. Note: Adobe asked them to remove Flash from update choices. It's still available if you pay for the Pro version or if you find an old Ninite Flash installer file online (just verify the signature first). Allow me to refer to the answers given to a similar question I asked over at Superuser.com, which I think are especially suited for the ServerFault.com/enterprise segment. Ninite packages cannot, as far as I know, be installed silently (unless you pay) and GUI options are not practical in any environment larger than a few computers. Two answers include registry settings (which can be deployed using Group Policy Preferences) and administrative templates, which can be deployed via traditional GPO's. In this answer, Danilo Roascio notes that you can add a REG_SZ registry value of SPONSORS in HKEY_LOCAL_MACHINE\SOFTWARE\JavaSoft and HKEY_LOCAL_MACHINE\SOFTWARE\Wow6432Node\JavaSoft. Set the value to DISABLE. This value can of course also be deployed using Group Policy Preferences. In another answer, Mike provides a neat administrative template that configure the same, for importing into a GPO. No. Installing Ask is completely optional (although this option is checked by default). So uncheck it and only Java gets installed! Install JRE on each user's home? How install Sun JRE private to my application? How can I install multiple Atlassian applications in a single server? Centos: OK to install JDK over the JRE?